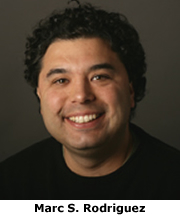 Marc S. Rodriguez, assistant professor of history and concurrent assistant professor of law at the University of Notre Dame, has been awarded a 2007 Career Enhancement Fellowship for Junior Faculty from the Woodrow Wilson National Fellowship Foundation. The award, which is funded by the Andrew W. Mellon Foundation, is granted to 20 people each year from applications across science, social science and the humanities. It is designed to assist talented tenure-track faculty to pursue scholarly research and writing during the fellowship year. Rodriguez studies and teaches Mexican-American history and American legal history. The son of migrant farm workers, his research has a particular focus on migration and the Tejano diaspora. Rodriguez is currently completing his first book, which details the growth of Mexican-Americanism among migrants and activists in both Texas and Wisconsin after 1950. A member of the Notre Dame faculty since 2003 and a fellow of the Institute for Latino Studies, Rodriguez earned his doctorate from Northwestern University and his law degree from the University of Wisconsin Law School. He was formerly a faculty member at Princeton University and completed postdoctoral research at the Clements Center for Southwest Studies at Southern Methodist University. Originally published by Kyle Chamberlin at newsinfo.nd.edu on February 16, 2007. Originally published by Arts and Letters at al.nd.edu on February 15, 2007.